Stainless-steel structural fasteners designed for lag-screw replacement. These 0.188"- and 0.276"-diameter hex-head fasteners require no predrilling, making them easier and faster to install than typical lag screws. They meet 2012 and 2015 IRC® and IBC® code requirements for several common wood framing and engineered-wood applications. Lag Screw Alternative Structural Fasteners SDS, SDWS and SDWH. 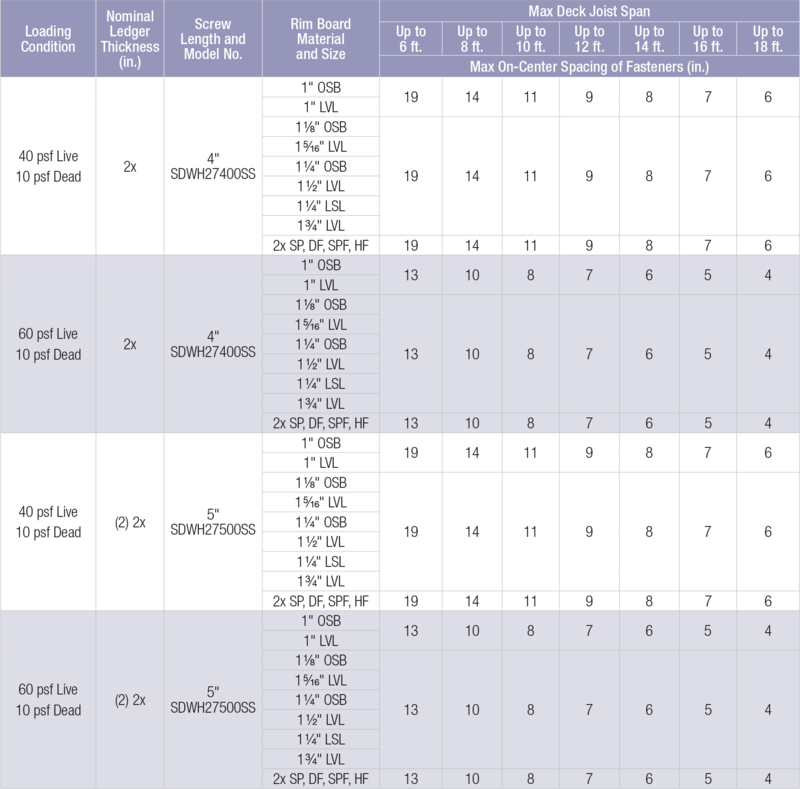 Allowable Loads for Strong-Drive® SDS, SDWS, and SDWH Structural Fasteners in Sawn Lumber Deck Ledger to Band Joist Applications. All applications are based on full penetration into the main member. Full penetration is the screw length minus the side member thickness. Allowable loads are shown at the load duration factor of CD = 1.0. Loads may be increased for load duration per the building code up to a CD = 1.6. Tabulated values must be multiplied by all applicable adjustment factors per the NDS. 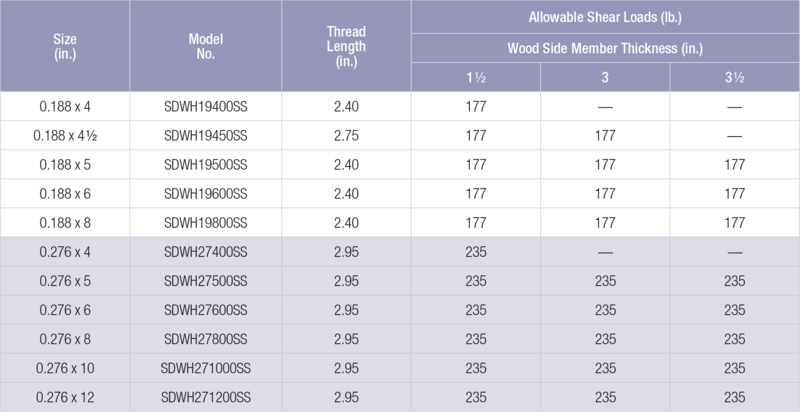 Table values based on testing in SPF lumber. Minimum fastener spacing requirements: 3" end distance, 1 7/16" edge distance, 1 1/2" between staggered rows of fasteners, 3" between non-staggered rows of fasteners and 3" between fasteners in a row. Design values include NDS wet service factor; no adjustment required for in-service moisture content greater than 19%. Allowable loads are perpendicular or parallel to grain. Installs best with 18v high-torque cordless or 1â2" low speed drill. If splitting occurs predrill with 5/32" drill bit for 0.188" screws and 7/32" drill bit for 0.276" screws. Allowable withdrawal load for the 0.188" screw for DF/SP is 155 lb./in. and for SPF/HF is 108 lb./in. Allowable load is based on inches of thread penetration into the main member. Allowable withdrawal load for the 0.276" screw for DF/SP is 260 lb./in. and for SPF/HF is 160 lb./in. Allowable load is based on inches of thread penetration into the main member. For LRFD values, the reference connection design values shall be adjusted in accordance with NDS-12, section 10.3. Screw spacing values are equivalent to 2012 /2015 IRC Table R507.2. The table above also provides screw spacing for a wider range of materials commonly used for band joists, and an alternate loading condition as required by some jurisdictions. Sawn rim board shall be Spruce-Pine-Fir, Hem-Fir, Douglas Fir-Larch, or Southern Pine species. Ledger shall be Hem-Fir, Douglas Fir-Larch, or Southern Pine species. Fastener spacings are based on the lesser of single fastener ICC-ES AC233 testing with a safety factor of 5.0 or ledger assembly testing with a factor of safety of 5.0. Spacing includes NDS wet service factor adjustment. Multiple ledger plies shall be fastened together per code independent of the screws. Rows of screws shall be vertically offset and evenly staggered. Screws shall be placed 1 1/2" to 2" from the top and bottom of the ledger or rim board with 3" minimum and 6" maximum between rows and spaced per the table. End screws shall be located 6" from the end and at 1 1/2" to 2" from the bottom of the ledger. For screws located at least 2" but less than 6" from the end, use 50% of the load per screw and 50% of the table spacing between the end screw and the adjacent screw, and for screws located between 2" and 4" from the end, predrill using a 5/32" drill for SDWH19 SS and 7/32" drill for SDWH27 SS. Structural sheathing between the ledger and band shall be a maximum of 1/2" thick and fastened per code. See Ledger-to-Rim Board Assembly illustration. See table footnotes above for deck ledger-to-rim board 0.188" screws.